Martijn Lakemeier experiences the harsh realities of war in Winter in Wartime. Winter in Wartime, the award-winning 2008 Dutch World War II drama directed by Martin Koohoven and based on the book by Jan Terlouw, was released on July 26, 2011, as a Blu-ray/DVD combo pack courtesy of Sony Pictures Home Entertainment. It carries a list price of $45.99. The movie unfolds in Nazi-occupied Holland in 1945, where 13-year-old Michiel (Martijn Lakemeier) is drawn into the Resistance movement after he helps a British paratrooper. What begins as an adventure quickly turns into a life of desperation and danger as Michiel becomes wary of the adults and townspeople around him, many of whom he’s not sure he can trust. Welcome to childhood innocence slamming into the harsh realities of wartime adulthood! 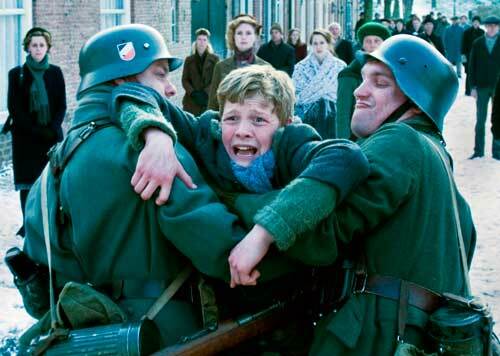 The winner of the Golden Calf Award at the 2009 Netherlands Film Festival as well as Best Actor (Lakemeier), Best Supporting Actor (Raymond Thiry) and Best Production Design, Winter in Wartime is currently enjoying a limited release in U.S. theaters. As of today, its Stateside box office returns are just under $400,000. Presented in Dutch, German and English with English subtitles, the Blu-ray/DVD combo pack includes a making-of short as a bonus feature. The movie was not be released separately on DVD or Blu-ray. Sony has been using this release strategy more and more with its smaller and foreign titles, most recently the French animated film The Illusionist and Of Gods and Men.